Rondom de kerk van Dranouter liggen verschillende Britse militairen begraven. 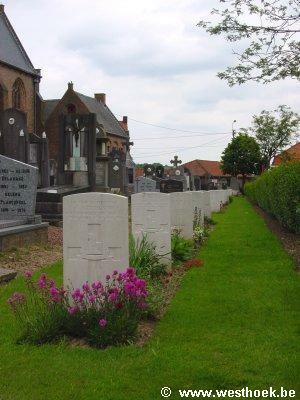 Dranouter Churchyard is located 11.5 kilometres south of Ieper town centre, on a road leading from the Dikkebusseweg (N375). From Ieper town centre the Dikkebusseweg is reached via Elverdingsestraat, straight over a roundabout onto J.Capronstraat (for 30 metres), then left along M.Fochlaan. Immediately after the train station, the first right hand turning is the Dikkebusseweg. On passing through the village of Dikkebus the road continues for 6 kilometres to the village of Loker. Continuing through the village of Loker, the road becomes Dikkebusstraat which runs for 2 kilometres to the village of Dranouter. The church and churchyard are located in the centre of the village. Dranouter was occupied by the 1st Cavalry Division on the 14th October, 1914. It was captured by the Germans on the 25th April, 1918, in spite of the stubborn resistance of the 154th French Division, and it was recaptured by the 30th Division on the 30th August, 1918. 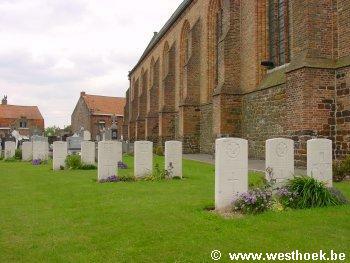 Dranoutre Churchyard was used for British burials from October, 1914 and July, 1915. 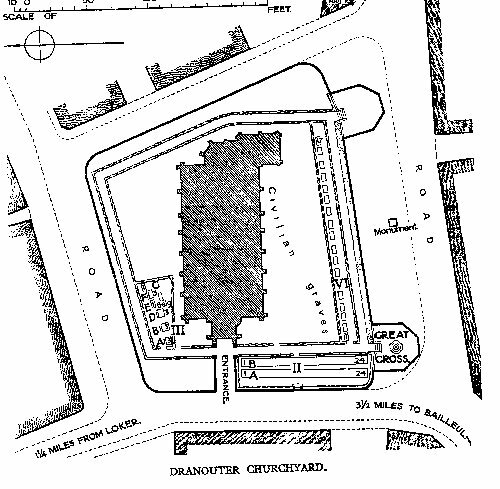 Six small plots were made: I and II at the West end, alongside the road; III, IV and V round the West end of the church; and VI along the South boundary of the churchyard. 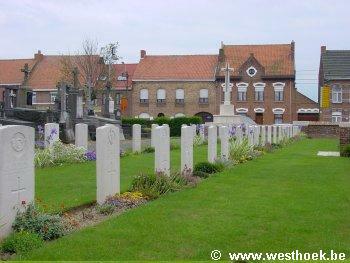 In 1923 it became necessary to move 19 graves (Plot IV, V and part of III) to Dranoutre Military Cemetery, to allow of the rebuilding of the church.